This perennial favourite is one that I wouldn't mind doing it over and over again. Those closer to me know I dislike pork with charsiew and Bak Kut Teh as exceptions. p/s: the charred bits could actually be scrapped off easily (check this out) but I just forgot to do so. 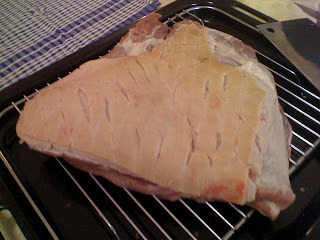 Below: the scalded pork skin and scored....poor pig...Scald in vinegar water. 2 tbsp of vinegar to 4 cups of hot. Dry it on a wire rack over a roasting pan. I then leave this to marinade and dry in the fridge overnight. Roast the meat side up first only followed by the skin. In the last 5mins, put it under the grill for the skin to blister but do not over do it! 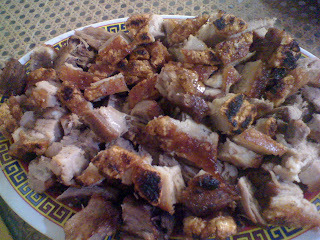 It's worth the try but get a more even piece of pork belly. Befriend your butcher and tell em you need it for siew yuk.